So it’s one of your first visits to Wichita and you’ve noticed the locals might seem to have their own language and dialect. Here is a guide to help you decipher your ICT experience. Don’t know what ICT means? Well, then we’ll start there. Wichita is a strange word, if you think about it, but how on earth did it get shortened to “ICT?” ICT means Wichita, yes, and is the most popular nickname and term of endearment for our great city. ICT is the airport’s call letters. When you see the letters around town or hear locals proudly sport them, you’ll now understand. If you haven’t noticed by now, Wichitans are proud of their city. The Wichita flag can be seen everywhere, represented on mugs, T-shirts, decals, license plates, jewelry and many other items. #FlagSwag is a collective term for all the gear you can buy with the Wichita flag symbol. Even if you don’t have a permanent tie to Wichita, you can still take a piece of ICT home with you. This pronunciation gets a little controversial. Is it “Juh-BEAR-uh” or “Juh-BAR-uh?” Trick question, it’s both. There are two sides to every story, and in this case, there are two sides to the family. One pronounces it “Juh-BEAR-uh” (Jabara Airport) and the other side pronounces it “Juh-BAR-uh” (Jabara’s Carpet Outlet). In Wichita, “Doo-Dah” is more than a diner. Similar to ICT, Doo-Dah is a nickname said to come from many Wichitans’ laid back attitudes. While you’re here, enjoy the chill environment, and you might as well grab some homemade biscuits and gravy at Doo-Dah Diner. A KFDI radio DJ coined the terms years ago. Wichita holds a ton of pride in its college basketball team, the Wichita State Shockers. The team has continued to gain popularity through multiple NCAA Tournament appearances and recent a trip to the Final Four (2013). Along with many other catchphrases, #PlayAngry became the hashtag the represented the Shockers’ attitude on the court. While it might seem negative to “play angry,” it is another way of saying “play aggressive,” and to power through adversity for the ultimate win. CII or C2 is what locals call Century II Convention & Performance Center. Offering a ton of opportunities for conventions, conferences, live cultural performances through music theater, orchestra concerts and opera, CII is the go-to place for a large majority of events. CII is the home of Music Theatre Wichita and Theatre League Wichita, putting on live Broadway shows through companies sometimes including former Wichita performers. Check out the current season to catch exciting live performances of your favorite Broadway hits. Sorry Arkies, this isn’t “Ark-can-SAW,” and the Arkansas River is not pronounced like the state. In Kansas, with our extreme sense of pride in our state, we pronounce it “our-KANSAS.” It doesn’t matter if it’s the river or its street namesake, you will be corrected by locals for any mispronunciation, but always in a loving manner. If you hear someone talk about “The Big Ditch,” they’re referring to an ongoing floodway project diverting part of the Arkansas River around the west side of Wichita. It runs near I-235 and people are often seen swimming in it when it has water, which is not recommended by local authorities because of the safety hazard. What did she just say? Don’t worry, The Hitman is harmless. One of Wichita’s most well-known radio DJs, Greg Williams has been entertaining the city for years on Power 93.9 (now Power 93.5). He plays hit rap, hip-hop and R&B music and hosts a morning talk show for thousands of listeners each weekday morning. In many towns, dragging main is a favorite pastime of teenagers who get their first cars or those not old enough to hit up active nightlife traditions. In Wichita, we drag Douglas, which makes up the main strip of the downtown area. You never know what kind of hidden gems you can find in new cities. Everyone knows the Keeper of the Plains is the most iconic Wichita attraction, but around this magnificent monument lies a hidden treasure. See if you can find the Troll located somewhere along the river, nearby the Keeper of the Plains Plaza. It showed up in May 2007 hiding inside a huge grate right by the Arkansas River. In 2013, a group broke into the troll’s hiding place and stole his arm and bird skull necklace. It was repaired and put back in its rightful place in April 2014. This word brings fond memories and disappointment to many ’90s kids in Wichita. It was the first and largest amusement park in the city, equipped with a rickety old roller coaster, “Wacky Shack” haunted fun house (though most couples would use this as an excuse to get close in the dark) and other carnival rides. Within the park, automated, autonomous Louie the Clown, sat in front of a Wurlitzer organ, playing a song that could be heard throughout the park. Joyland is now abandoned and has made the list of the creepiest theme parks in a book called, “Bizarro: The World’s Most Hauntingly Beautiful Abandoned Theme Parks.” Joyland will forever resonate in the hearts of the Wichitans who got to enjoy it, and many were sad to see pieces of it sold and the lot shut down. However, you can still catch a piece of Joyland by visiting Botanica Wichita, where organizers are working to install a carousel pavilion in the middle of the property. Currently, some of the carousel horses are on display in the main Botanica Wichita building, near the gift shop. You can find a few vintage signs from the park at Churn & Burn in south Wichita. Another attempt at an amusement park left many people with a bad taste in their mouth. The concept, though brilliant for a Wichita theme park, was a major bust. Wild West World was open from May through July 2007, and went bankrupt before it got a chance to succeed. The park buildings are abandoned, though still standing. These are just a few of the words you might hear come up in conversation during your adventure in Wichita. 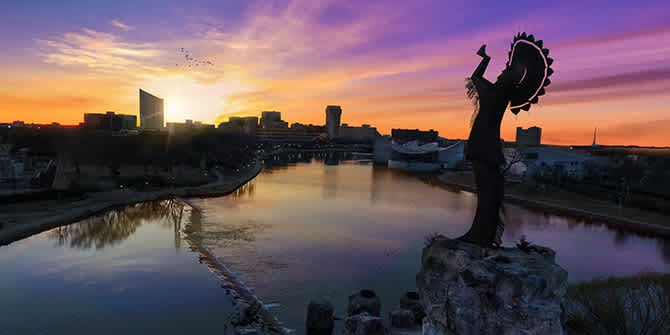 Every town has its tales, stories and unique history, but Wichita’s rich culture and local lingo sets it apart from the rest. Now that you speak fluent Wichitan, go out and explore what ICT has to offer.